The B991-CP heavy duty executive office chair, from Boss Office Products, features CaressoftPlus upholstery or brown bomber LeatherPlus. CaressoftPlus is a breathable and extremely durable vinyl that mimics the look and feel of high end top grain leather. Other features include double plush, foam padded seat and backrest cushions, built in lumbar support curve, heavy duty spring tilt recline mechanism, tilt with tilt lock, tilt tension adjustment, fixed position armrests with padded arm-caps, pneumatic seat height adjustment, 360 degree swivel and a 27 inch heavy duty steel base with 3 inch oversize carpet casters. Rated for users up to 400 lbs. 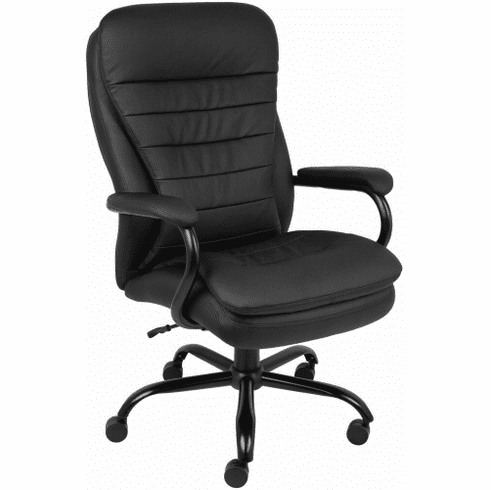 This heavy duty executive chair meets or exceeds ANSI/BIFMA standards. Dimensions: Seat Size: 22.5"W x 18.5"D. Seat Height Adjustment: 20.5" - 23"H Overall: 33.5"W x 31"D x 43"-45.5"H. Six year limited warranty from Boss. This chair normally ships within 2-3 business days from either our CA or GA warehouse.